of mine roadway retaining wall supporting projects. according to customers�� design requirements or drawing. cost is lower than the similar long-span bridges, culverts. has a very considerable application prospect. Posted By: Great Wall Corrugated Steel Pipe Co., Ltd.
capacity and a promising future due to its features. 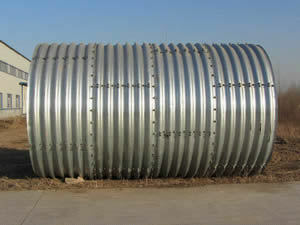 We can provide corrugated steel pipe of a service life from 25 to over 100 years. It can be galvanized (25 years), aluminized (75 years), asphalted, and polymer laminated (100 years). Your choice of coatings depends on the soil conditions and other site or application factors. To meet your design service life requirement it is necessary to have an environmental assessment.